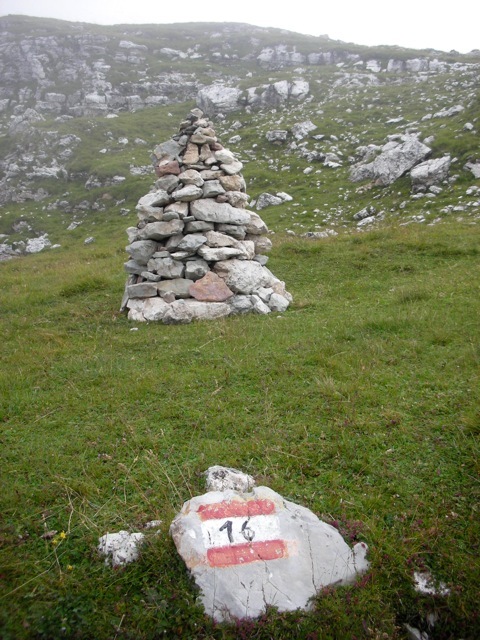 A cairn all the way from Italy. My pal Terry was hiking with her man in the Dolomites when she saw this handsome cairn. They were hiking down from the Rifugio Puez, part of Italy’s amazing backcountry hut system (several years ago I visited a refugio where we got espresso and lardo–mmmm! ), and had just seen a “cute flock of sheep,” when they came across this pile of dolomite cobbles and boulders. She said she took a photo of it because it was so nice looking and because she happened to have her camera available instead of being deeply buried in her pack. Grazie Terry.